Fresh from reaching the final page of Mike Badger’s autobiography and alternative history of Post-Eric’s Liverpool, Getintothis’ Del Pike meets up with the man himself to discuss The La’s, and Viper Records. When The La’s launched themselves onto the British music scene in the late 80s, their first singles Way Out and There She Goes were met with a mixture of indifference and mild curiosity. A couple of re-issues and their self-titled debut later and they were suddenly finding critical acclaim. No doubt helped by their sudden departure from the limelight and subsequent split, and just as they were becoming contenders for major Oasis rivals, The La’s were quickly to become legends due to their own bad timing. Frontman Lee Mavers was soon to be regarded as some sort of enigmatic prophet and John Power would go on to create Cast. Nowhere, however, in the sleeve notes for the Go! Discs re-release of the album or in the many early interviews with the band, is there a mention of the their founder member, a man written out of the story and whose very existence the label denied to the music press. The man in question is Mike Badger. He formed the band, created their name and jumped ship just before fame hit due to the ever growing ego of Mr Mavers that Mike found difficult to endure. As The La’s have never truly reformed and Mavers has created an almost Howard Hughes-esque persona, the legend of this most promising of bands has endured and any snippet of information on what really went on in those early days is a must for their fans. The Rhythm and the Tide is Mike Badger’s attempt to put the record straight, a book he has co-written with music journalist Tim Peacock and one they are currently touring around the bookshops of England and Ireland, and it certainly reveals the reasoning for Mike’s departure and explains to some extent how Mavers created his own enigmatic status. When we asked Mike if he would care to chat about his book he suggested we meet in The Pen Factory on Hope Street, a bar clearly close to his heart as hanging in the window as you enter is one of his iconic tin sculptures, a mesmeric mobile of planets and spaceships straight from a 50s Sci-fi B movie. Mike’s heart is clearly beating in that era, as many of his tin projects have that retrospective feel. His post-La’s music output has also moved further into the rockabilly rhythms that are hinted at in those early demos. 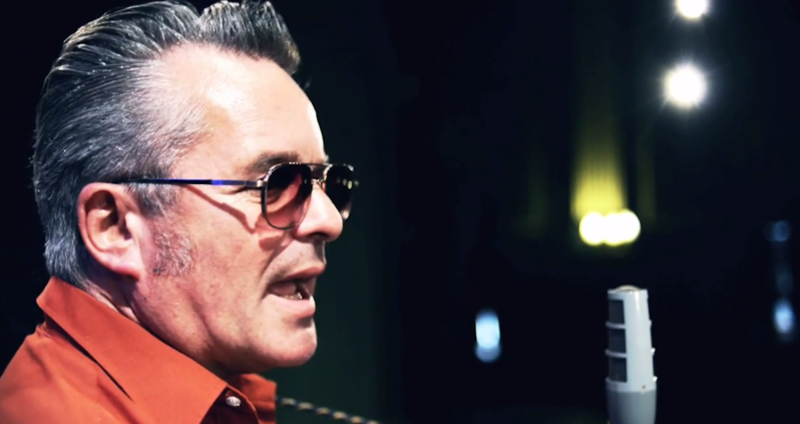 His work with The Onset and more recently The Shady Trio is a sublime mix of country, rockabilly and blues, a unique fusion of Scouse Americana. As we take our seats Mike points out another sculpture hanging above our heads, a sparkly tin fish. These are his babies. A section of the book reveals how long after the La’s withdrawal, Lee and Mike met up and started work on new La’s output. The promise of new material did not materialise unfortunately but the meeting of minds did result in the release of two albums of unheard La’s material from the early years, released through Viper, a label Mike owns with former La and current Tommy Scott collaborator, Paul Hemmings. The thing that strikes you when chatting with Mike is his positive take on life, and we tell him that the most appealing aspect of the book for me was his sense of wonderment at life and the joy he finds in meeting people he admires, there is an innocence there that is quite inspiring. We have talked about the untimely death of Kris Ealey, the 38 year old actor and musician who Mike was very close to, he had worked with Kris’s former band Tramp Attack, later producing and releasing their second album on Viper. “Life is precious, as losing Kris yesterday proves” Mike weighs it all up; “I don’t want a big penthouse in town, I’m happy with what I’ve got. It is difficult to be involved in music and make a living out of it unless you’re U2 or someone really successful like that, but in some ways I am grateful things didn’t work out with The La’s as I wouldn’t have been able to develop my fine arts career which is what puts bread on the table.” Mike’s sculpting includes work for Space’s Tin Planet project back in 1998, with his creation of the tin robot on the cover and in the Avenging Angels promo. The robot now lives in a glass cabinet in the Museum of Liverpool’s permanent music exhibition. Another notable sculpture hangs in the space above Cavern Walks, depicting The Beatles’ instruments. Having enjoyed a career that has spanned music, art, literature and managing a label, Mike is able to reflect on how lucky he has been: “I have been blessed with a sense of self which I think an artist has to have. If you can’t believe in yourself then you can’t expect any other fucker to do it for you. Artists are very egocentric and self-obsessed and I’m aware of that but at the end of the day you’re expressing something that is deeply personal for you. Throughout the book Mike talks about his encounters with his heroes that include a life changing encounter with Don Van Vliet (Captain Beefheart), an almost supernatural encounter with Frank Sidebottom and his puppet pal Little Frank and a series of adventures involving putting up Jonathan Richman for the night in his Aigburth flat. We discuss his chance encounter with a hero that we both have a love for, the late Lux Interior of The Cramps. Mike recently provided bed and breakfast again for Stray Cats drummer Slim Jim Phantom, another hero who Mike is clearly excited to have made a new friend of. Jim headlined alongside Liverpool’s rockabilly hellcats, Furious at Mike’s recent Action Packed rockabilly night at The Magnet. When he’s not making music Mike is promoting it across the city with nights such as these, his Viper label and his annual charity fundraising festival at Shy Lowen Horse Sanctuary in Netherton. My only criticism of the book, and this is in some way praise, is that it ends too soon. Much of Mike’s later adventures are every bit as interesting, if not more so than the La’s memoirs, but they end rather abruptly, missing out almost the past decade of activity. Mike explains this was a decision of the publisher as they felt it was becoming too weighty. The cutting room floor remnants would include accounts of visits to Texas where Mike has enjoyed recognition playing festivals and earning radio airplay, a dream come true. His more recent work has adopted a cowboy blues style, particularly in his Mike Badger’s Countryside album, released in 2009. His work on Viper records has surpassed the 100 albums mark and has included not only original recordings by amongst others Edgar Jones, the Hokum Clones and Tramp Attack but also a whole host of archive albums pulling together vital long lost cuts from Liverpool’s music heritage in his Unearthed collections from the Merseybeat and Post-Eric’s eras and also his American underbelly series which are celebrate the weird and wonderful worlds of Christmas, Halloween and B Movie Sci-fi tunes. The surprise revelation in the book is in Mike’s contribution of the theme tune to the BBC’s daytime drama Doctors. “It’s a real curveball as it brings in more money than anything and we knocked it out in 5 mins. You work it out ‘cause I can’t” he laughs. Mike’s book is available now and is an addictive read, not just for La’s fans but to anyone who has ever wanted to be involved in the music business. It shows that it’s not all about the Cowell model and it’s there to be enjoyed. It is also an insightful and affectionate account of the Liverpool Music scene in the late 70s and 80s with an overflowing cast list of Liverpool notables, all of whom are dear to Mike’s heart and have played some part in his fascinating story. The Rhythm and the Tide is published by Liverpool University Press. 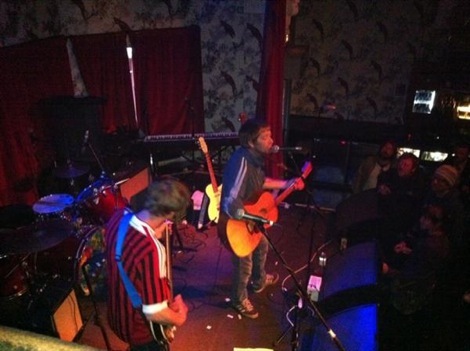 Previous ArticleParquet Courts, Housewives: Invisible Wind Factory, Liverpool.